Awhile ago, I was invited back to Charlie Brown Cafe as I was told that they had revamped their menu and there were a few new offerings on their menu. 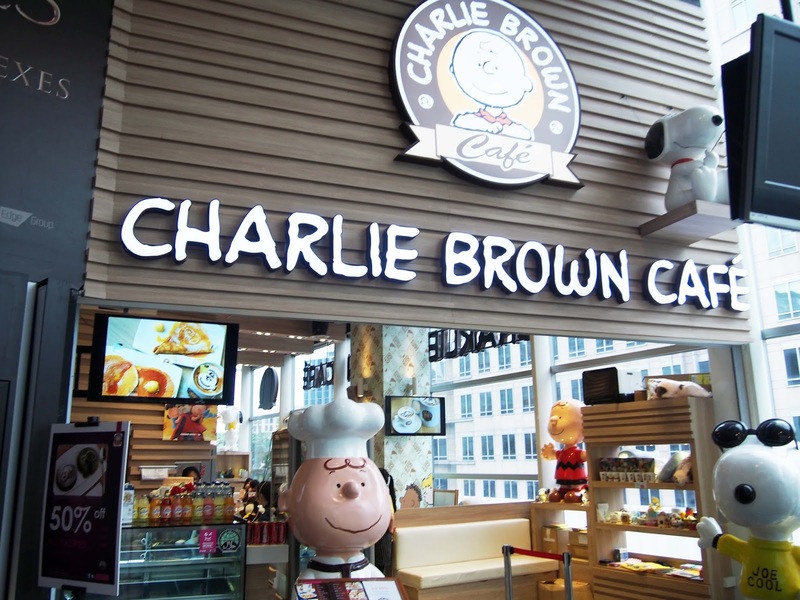 Charlie Brown Cafe now has 2 outlets mainly in Singapore, one located at Cathay Cinleisure Orchard, a popular youth destination, and One KM Mall at Paya Lebar. 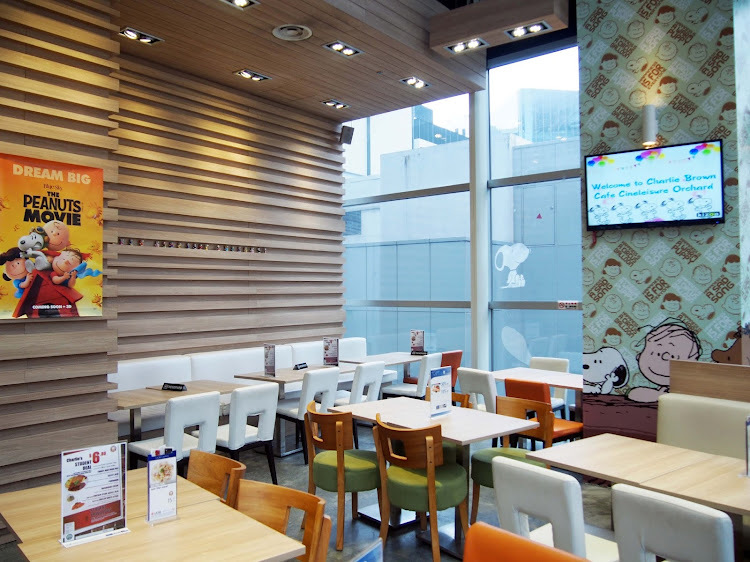 The entire cafe is designed in a Charlie Brown theme, if you had watched the movie, Peanuts or you grew up watching Charlie Brown, then you should be familiar with the characters in the show/movie. The entire cafe takes up about 30-40 seats and the ambience was conducive. 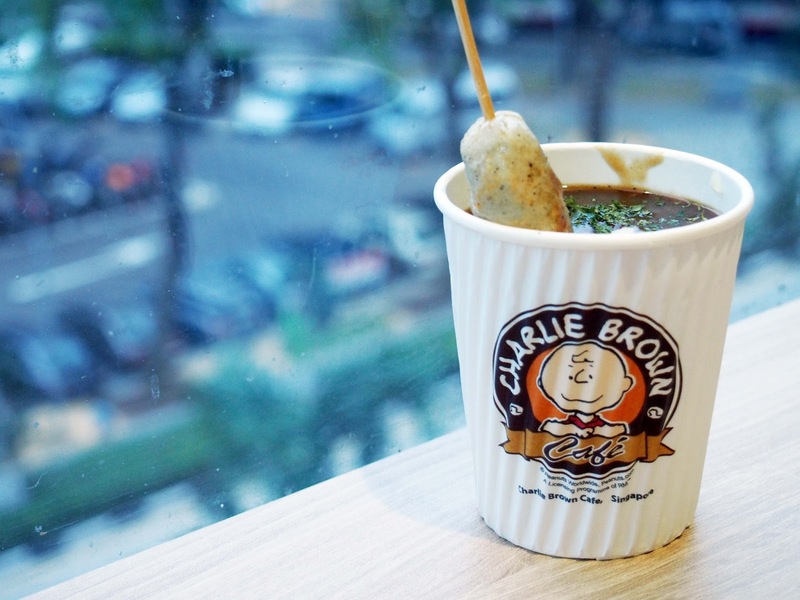 Made from fresh potatoes topped with gravy and chicken chipolata (sausage). The mashed potato was fluffy and wasn't lumpy just maybe the sauce was slightly overpowering which diminishes the taste of the mashed potatoes. I would prefer if the sauce was lesser. However, it was a great combination of adding the chicken chipolata and mashed potato together. I don't mind just walking into Charlie Brown Cafe next time just to by their mashed potatoes for take-away. Needless to say, this was my favourite dishes and I did not regret ordering it. It was recommended by the waiter as she said that it was one of the popular dishes that customer will always order. Being a cream-based lover, I decided to give red tomato sauce a try for the first time. 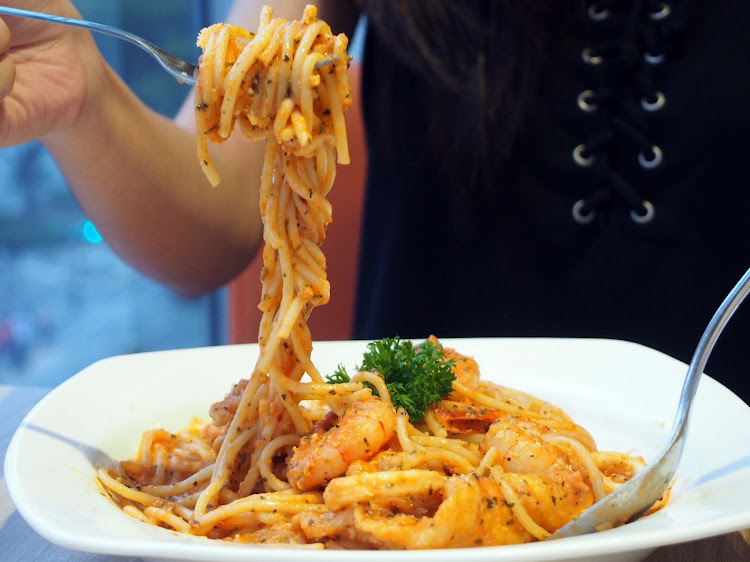 I was pleased with this dish because firstly, the portion given was very generous (unlike some other places) where you will only get a handful size of spaghetti. For a big eater like me, the portion was satisfying. 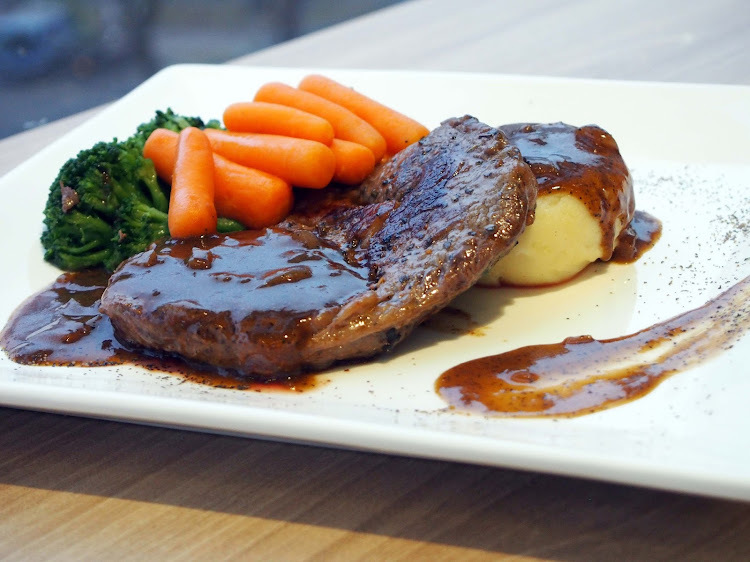 The sauce was rich and creamy and it is non-spicy, so it is perfect for children as well. 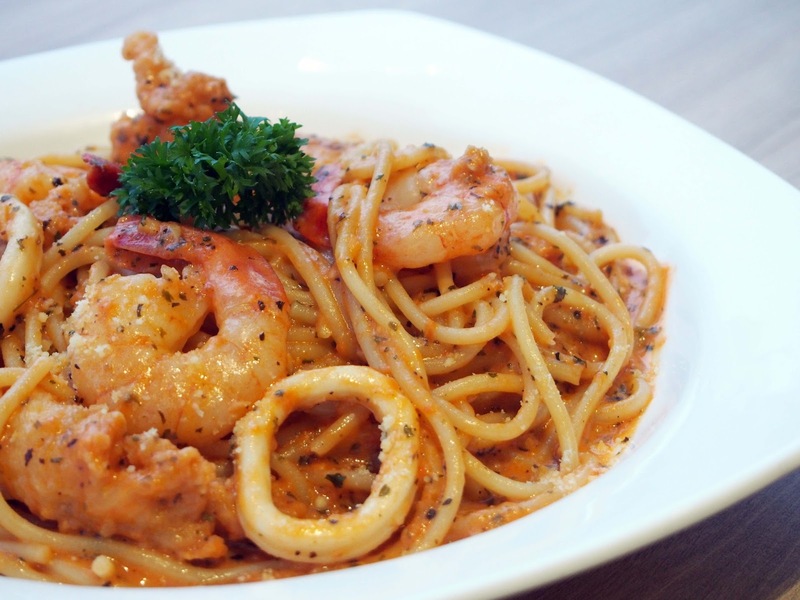 The dish was also topped with hearty amounts of squid, fish and also prawns. 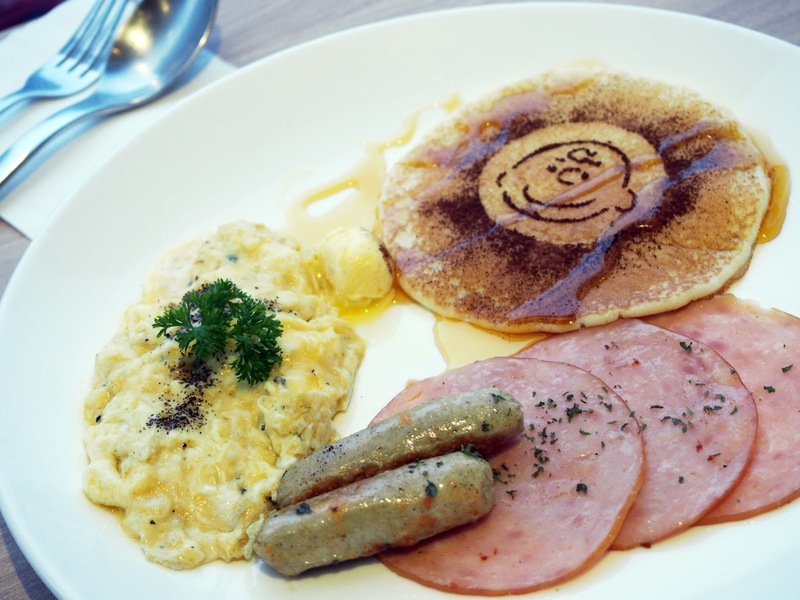 Charlie Brown Cafe serves all-day breakfast, so if you are looking for a quick pancake or scrambled egg fix then you found the right place to dine at. 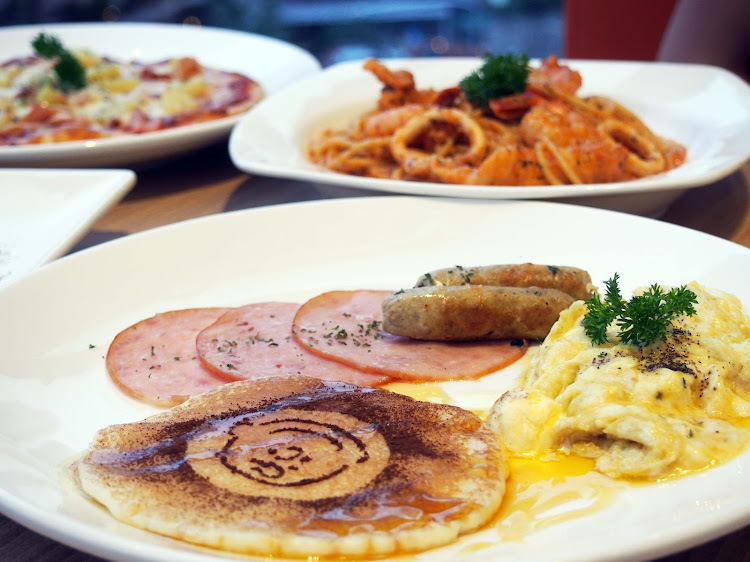 The breakfast set is served in a big plate with chicken chipolatas, turkey ham, scrambled eggs and pancakes (or crepe upon request). The streak was prepared well-done and the consistency was there. 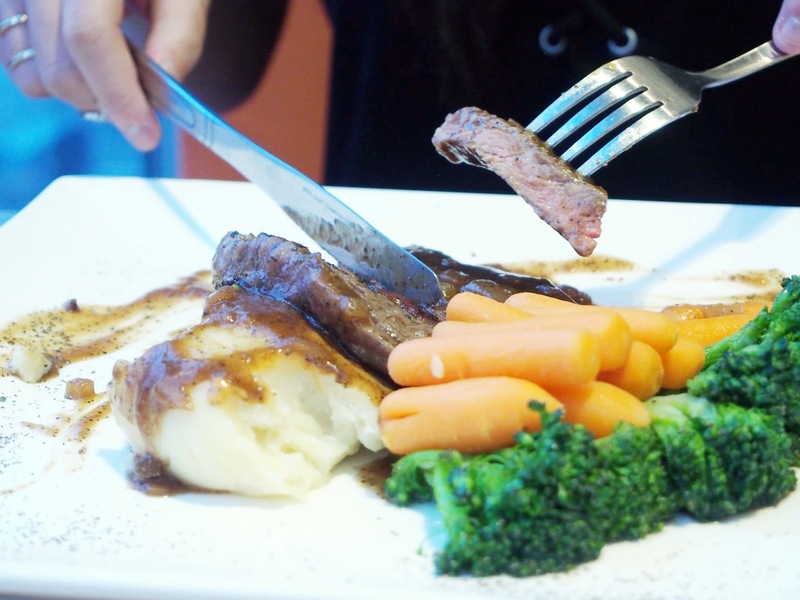 It was also topped with pepper sauce, served with mashed potatoes and a few pieces vegetables. Plus points for efforts for over presentation of the dish, more sauce would be preferred if not the dish will be quite dry. Overall, it was a good piece of steak. For a decent price of $12.80 I find it valuable as it can be shard among 4 people. 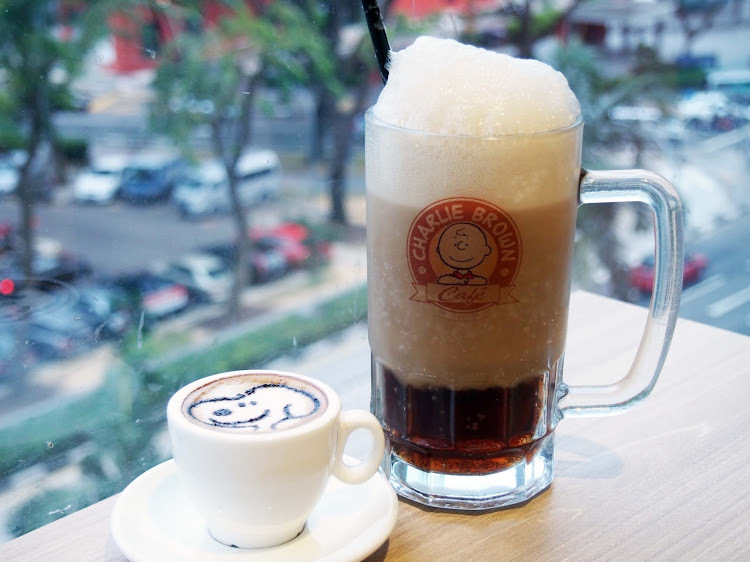 Though from afar, it might not look appealing but after your first bite, you might want to change your perception as because as first I was deceived by it's looks. The pizza was thin crust, and the pizza was served with generous pieces of pineapples and topped with melted cheese. 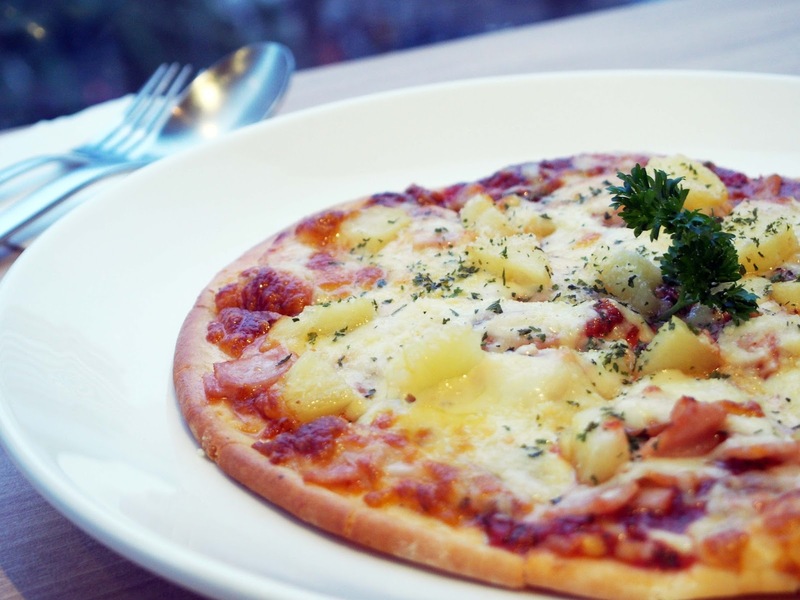 It would be better if there can be more parmesan cheese added. 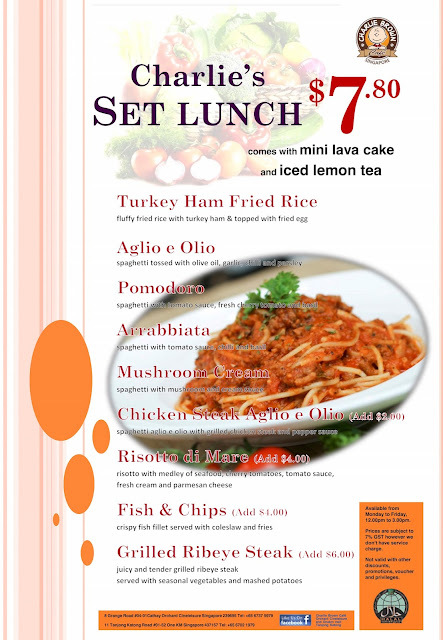 Do check out Charlie Brown's Weekday Promo lunch set for only $7.80 onwards, every weekdays from 12:00PM - 15:00PM! It comes with a lava-cake dessert and also iced-lemon tea as well!